Annual 2017 Snow Majesty 13th Lenox Ornament Silver Christmas Ornaments Edition. Add shimmer and sparkle to your holiday tree with the 2017 Snow Majesty 13th Annual Ornament. 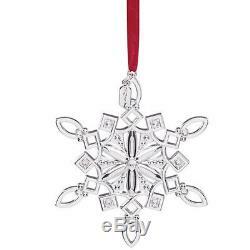 Crafted in shining silver plate, this lovely snowflake is decorated with glittering crystal accents. Simple and elegant, with red ribbon for hanging, this beautiful ornament makes a wonderful gift. The item "Annual 2017 Snow Majesty 13th Lenox Ornament Silver Christmas Ornaments Edition" is in sale since Friday, October 6, 2017. This item is in the category "Collectibles\Decorative Collectibles\Decorative Collectible Brands\Lenox\Ornaments". The seller is "revati6" and is located in Phoenix, AZ.